Meet hydraulic system needs with industrial pump drives in a wide variety of gear ratios, including speed-increasing and speed-reducing configurations. 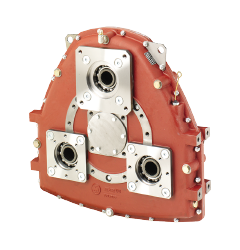 Modular design choices include a flexible coupling, rubber block drive, or clutch to match your SAE engine flywheel dimensions. Independent mounting is an option, direct or with a clutch. Twin Disc also offers standard and specialized SAE and DIN adaptor kits. Pump drive model numbers indicate the number of pump pads, using the first numeral after the “AM” designation. Models AM 232, AM 365, AM 450 and AM 480 have additional pump pads on the input side.